This strikes a chord with the last comment I’d made in this morning’s coffee thoughts – that I could feel a portal opening in front of me and things would become clear. The Moon in Tarot signifies illusion, or moving through a shadow realm. Things feel more fearful, more emotional, more uncertain. Walking through the woods during the day, we can rejoice in their beauty, take in with delight the songs of the birds, play with pine cones, and enjoy the woods for what they are. But walk through the woods at night? Suddenly you feel like you’ve been sucked into the Blair Witch Project and everything makes you fearful. Senses are hightened. We become aware of every sound as if they signify attack, and we’re aleart for any dangers (including those that aren’t real!). This is the feeling we have when we’re under the influence of The Moon in Tarot. The fact that this card is inverted today makes me feel as though the energy of this card is waning, moving away… as though sunrise is about to happen. It’s always darkest before the dawn – and things have been very dark in Wendiland lately – on all counts, every plane, each dimension from romance to work to domestic situations to physical health. The viel is about to be lifted, though – and I take this card as a sign that it’ll be lifting soon. 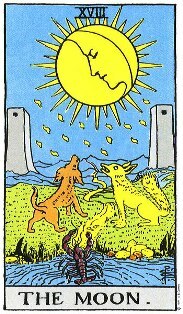 In the Tarot, the card that comes right after the moon is The Sun! Sadly, we are usually afraid of the Moon. In readings, this card often stands for fears and anxieties – the ones that come in the darkest part of the night. Card 18 also stands for illusions. It is easy to lose our way in the moonlight. Be careful not to let deceptions and false ideas lead you astray. Sometimes the Moon is a signal that you are lost and wandering aimlessly. You must find your way back to the path and your clarity of purpose. If you look around the room right now, you will (probably!) see people and objects that are comforting in their familiarity. Everything is exactly as you expect it to be. You know that if you closed your eyes and opened them, the room would be the same. But…have you ever lost the familiar to find, in its place, a world so extraordinary you can’t even grasp it? This is the experience of the Moon. Most of the time we live in a tiny pocket of normality that we wrap around us like a security blanket. We turn our backs on the mysterious universe that waits outside. From time to time we may sneak a peak with our imagination, or venture out through fantasy or expanded awareness. We can be thrust out there unprepared through drugs, madness or intense experiences such as battle. The Moon is the light of this realm – the world of shadow and night. Although this place is awesome, it does not have to be frightening. In the right circumstances, the Moon inspires and enchants. It holds out the promise that all you imagine can be yours. The Moon guides you to the unknown so you can allow the unusual into your life. A full moon (with a crescent within), twin pillars, two dogs/wolves howling, a stream that runs to the ocean, a crayfish emerging out of the water. Following the star the Fool travels through the night. The full Moon rises, illuminating for him a watery path. And he begins to feel disoriented, as if walking in his sleep. He passes under the moon, between two pillars ancient and strange. Suddenly, he looks around to find himself in another land entirely. When he was in the presence of the High Priestess, he saw hints of this dark land through the sheer veil draped behind her throne. And later, when he hung from the tree, he felt himself between the physical world and this one. Now, he has at last passed behind the veil. Here are the mysteries he sought, at least, here are the dark mysteries, ones that have to do with the most primal and ancient powers; powers of nature, not of civilization. It is a land poets, artists, musicians and madmen know well, a terrifying, alluring place, with very different rules. Wolves, howling in homage to the moon, run wild across this land, hunting along side maidens with bow and arrows; and creatures from childhood nightmares and fantasies peer from shadows, eyes glowing. The path the Fool was walking is now a river, and he stands hip-deep in the powerful pull of its salty, moonlit waters. There is, on the nearby shore, a small boat, but it has no rudder, no oar. The Fool realizes he has only two choices. He can lose himself in this desolate, primal land of madness and illusion, howl with the wolves, be hunted down, or he can get into the boat, and trust himself to the river. The moon will be in control either way, but in the boat, his surrender to the powers of the unconscious and the natural world will at least take him somewhere. As the artists and poets and magicians know, inspiration, visions, genius, Moon magic, are the rewards of such surrender. The Fool gets into the boat, and shoves off. As the waters sweep him away, moon beams light his “path” and he feels the Mistress of this dark land gazing down at him with the High Priestess’s approving eyes. With Pisces as its ruling sign, the Moon is all about visions and illusions, madness, genius and poetry. This is a card that has to do with sleep, and so with both dreams and nightmares. It is a scary card in that it warns that there might be hidden enemies, tricks and falsehoods. But it should also be remembered that this is a card of great creativity, of powerful magic, primal feelings and intuition. The Querent who gets this card should be warned that they may be going through a time of emotional and mental trial; if they have any past mental problems, they must be vigilant in taking their medication. They should avoid drugs or alcohol, as abuse of either will cause them irreparable damage. This time however, can also result in great creativity, psychic powers, visions and insight. They can and should trust their intuition. This is the card of that scary, dreamy, secret otherworld where lies the most powerful and dark magic. Primal magic. It is the card that you’d get for Jackson Pollack types, switching between being wild, mean, crazy drunks and creative geniuses. They have wicked mood swings, dark, dark, dark depressions, charming manic modes. They have no inhibitions, don’t even try to behave themselves in polite society, their crazy behavior sometimes inspired, sometimes horribly embarrassing, even unbelievable and even dangerous. But the art, poetry, music they produce….it’s magic. When I get this card, I let the Querent know they’re in for an emotional and mental rollercoaster ride. They can do two things, either wander through this crazy, lunatic landscape howling at the moon (get drunk, wallow in depression, alienate friends and family with wild, antisocial behavior), or get in a boat and go through it purposefully (paint something!). Intuition; deception; night work; hidden dangers; instinct; struggle for sanity; change; possible confusion; magick; gossip; stuck between a rock and a hard place; self-esteem issues; empathetic. Astrological association: Pisces. As a temporary vibration: Caution, dreaming, healing, body care. You must slow down the fast pace of your life. You need to pay more attention to your bodily needs; therefore, exercise outdoors, eat properly and get sufficient sleep. Your dreams are active now, and any sleeplessness you experience is the product of an extremely vivid imagination. New plans and ideas are forming in your mind. Do not start new projects, but rather allow the ideas to germinate. They will blossom at a later date. Maintain your present status while considering changes, such as new occupation. Healing forces are working beneath the surface, and your health can improve if you allow periods of quiet conteimplation to calm your mind. Your thoughts have a potent control over your bodily processes now. Sign documents carefully or not at all, if possible. Be on guard against deception in business and difficulties in personal affairs. Family quarrels and accidents are caused by rashness or carelessness. Travel is not advisable. Mental unsettledness can bring a physical illness. Wars and revolutions are brought on by such vibrations. You have a unique opportunity to organize your life now. Set your environment in order, clean your house, organize your desk, finish up odds and ends. Such actions will direct your subconscious to set itself in order as well. Then your dreams and visions will express the future direction you should follow. Tarot Symbolism: Key 18: The Moon. Evolutionary growth and development come under key 18. The keywords are organization and sleep. The function of the Moon is sleep, and during sleep, waste is eliminated and new materials are woven into the body. Consciousness continues while the upper brain cels rest. It is during sleep that our aspirations and efforts are being built into the body cells. What we think and do all day goes on influencing the body while we sleep. Every cell is a center of consciousness, and every cell contains spirit. Astrologically, Pisces, the final sign of the zodiac, rules this key. The dog and wolf are of the same species, but one is wild and the other is domesticated (depicting nature aided by human consciousness). The towers are human handiwork. The thirty-two rays of the Moon iindicate the thirty-two paths on the Tree of Life, and the faling yods represent the decent of the life force from a higher plane into the material world. Many symbols here show that we can change the outward structure of things. They are proof that the same changes may be accomplished within the body through organization and cultivation. Astrological correspondence: The Sun (and Pisces). The test of Saturn (8) is energized and supported by Mars (1), resulting in full attainment and realization (9, The Sun). With the combination of the Sun and Pisces, final completion is possible under this number. The Sun, representing true individuality finds its own true identity in key 18, which symbolizes body consciousness. By combining body consciousness and control with realization of one’s self, all things are possible.